Kilauea Volcano on the island of Hawaii is one of Earth's most active volcanoes, drawing scientists and tourists alike from all over the world to study and witness its spectacular displays of nature. This month, a NASA-led science team is exploring Kilauea and the adjacent volcano Mauna Loa from the air, ground and space. Their goal: to better understand volcanic processes and hazards. In late January, scientists from NASA, the USGS Hawaiian Volcano Observatory (HVO), Hawaii Volcanoes National Park, and several universities embarked on a six-week field campaign to study the links between volcanic gases/thermal emissions and vegetation health and extent; the flow of lava from the volcanoes; thermal anomalies; gas plumes; other active volcanic processes; and ways to mitigate volcanic hazards. 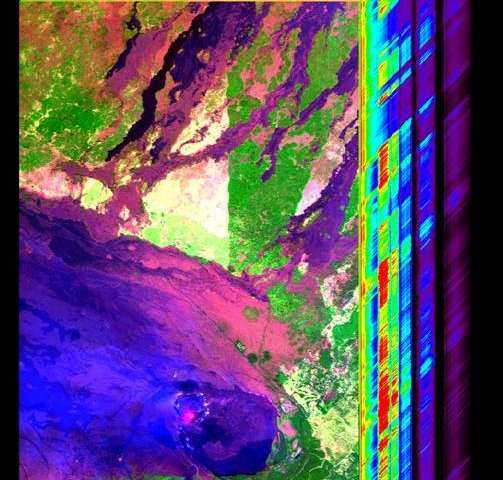 The campaign, which is also studying Hawaii's coral reefs, will provide precursor data for NASA's Hyperspectral Infrared Imager (HyspIRI) satellite mission concept to study Earth ecosystems and natural hazards such as volcanoes, wildfires and drought. A high-altitude ER-2 aircraft from NASA's Armstrong Flight Research Center, Palmdale, California, based at Marine Corps Base Hawaii on the island of Oahu, is the main platform for the HyspIRI airborne campaign. The ER-2 carries the Airborne Visible and Infrared Imaging Spectrometer (AVIRIS), developed by NASA's Jet Propulsion Laboratory, Pasadena, California; and the MODIS-ASTER Airborne Simulator (MASTER), developed by NASA's Ames Research Center, Moffett Field, California. This week, a Gulfstream III aircraft from NASA's Johnson Space Center, Houston, will join the campaign. 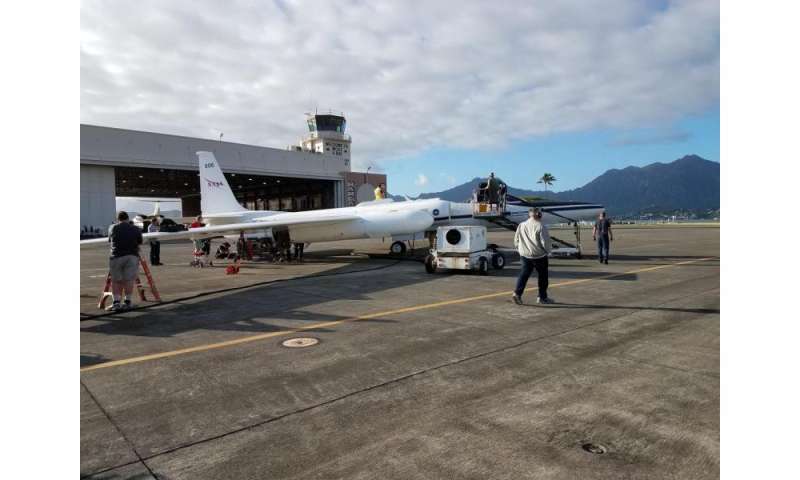 It will carry JPL's Glacier and Land Ice Surface Topography Interferometer (GLISTIN) instrument, which will collect high-resolution data to measure topographic changes from new Kilauea lava flows. "The data collected during the HyspIRI airborne campaign will advance our understanding of volcanic processes on Hawaii and elsewhere around the world," said Ben Phillips, lead for NASA's Earth Surface and Interior focus area, NASA Headquarters, Washington. "Such observations may inform future decisions by volcano hazard responders and regulatory agencies." 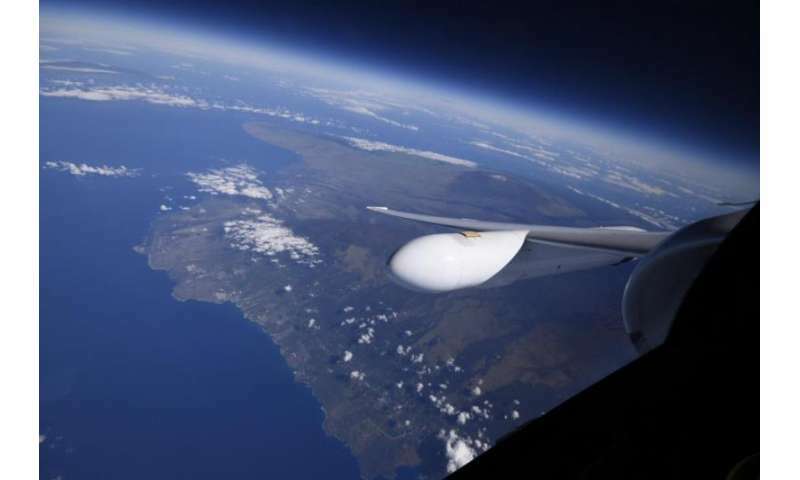 Flying at 65,000 feet (19,800 meters), above 95 percent of Earth's atmosphere, the ER-2 can closely replicate the data a future satellite could collect. The instruments onboard are designed to carefully measure reflected sunlight and emitted thermal radiation in hundreds of distinct channels. The data give scientists quantitative and accurate information on Earth surface composition, types of gases and temperature. By combining these data with ground-based validation measurements, scientists can study atmospheric, geologic and ecological processes to understand our natural environment. Vog: JPL scientist Vincent Realmuto is using MASTER and AVIRIS data to study vog, the island of Hawaii's notorious volcanic air pollution. His team is studying Kilauea's releases of heat and gas, mapping the composition and chemical evolution of its gas plumes. When Kilauea's summit resumed erupting in 2008, sulfur dioxide emissions increased dramatically. Sulfur dioxide converts to sulfate aerosol to create vog: a noxious, corrosive suspension of sulfur dioxide and fine sulfate aerosols. Communities downwind of Kilauea suffer adverse effects. To help the public deal with vog, the Vog Measurement and Prediction Project (VMAP) at the University of Hawaii-Manoa (UH) produces forecasts of vog motion and concentration across the Hawaiian Islands. VMAP uses sulfur dioxide emission rates measured by HVO to set the initial conditions for the vog forecast. The accuracy of the forecasts is evaluated by comparing them with air quality measurements from a sparse network of ground stations. Realmuto's team is using MASTER data to map sulfur dioxide concentrations at Kilauea's summit and track changes in concentration with distance from the summit. AVIRIS data are used to map concentrations and spatial distributions of sulfate aerosols downwind of the summit. The data will help scientists better understand how quickly sulfur dioxide gas converts to sulfate aerosols, and create maps of how the rates vary from place to place. The gas and aerosol maps derived from the airborne data will be validated with ground-based data collected by HVO and UH scientists. The validated maps will be used to initialize the VMAP forecasts to assess the impact of the new data products on their accuracy. In the future, data collected during a spaceborne HyspIRI mission may contribute substantially to Hawaii air quality monitoring efforts. These observations will be used to estimate sulfur dioxide and sulfate concentrations at a spatial resolution of about 200 feet (60 meters) on time scales of hours to days. "Such timely observations may be used to track changes in the behavior of volcanoes and may lead volcano observatories and air quality officials to increase their scrutiny of such changes," Realmuto said. "The experience we gain from the HyspIRI airborne campaign will allow us to make immediate use of the data from a spaceborne HyspIRI mission." Links between volcanoes and plants: Scientist Chad Deering of Michigan Technological University, Houghton, is leading an investigation to detect changes in volcanic state by using AVIRIS and MASTER data to remotely measure possible links between volcanic gases and their thermal emissions, and the health and extent of vegetation near volcanoes. When a shallow magma reservoir is replenished, it can signal either the start of an eruption of an active, but not currently erupting, volcano like Mauna Loa, or significant changes in behavior at an erupting volcano like Kilauea. Rising magma releases gases through the surface. Detecting and characterizing these gas emissions and their indirect effects on vegetation may help hazard managers better detect significant changes in volcanic behavior and monitor shifts in the location of the activity. How volcanic gases and aerosols are transported: JPL researcher David Pieri is using instruments on small unmanned aerial platforms (free-flying unmanned aircraft and tethered aerostat kites) to conduct ground-based validation of MASTER and AVIRIS data. The unmanned aircraft and kites are operated in conjunction with NASA Ames and NASA's Wallops Flight Facility, Wallops Island, Virginia. The instruments are sampling sulfur dioxide, carbon dioxide and aerosols at Kilauea. The data will improve understanding of how gases and aerosols are transported in the atmosphere and will help improve estimates of volcanic gas emissions. Pieri's team will also acquire simultaneous data with the Advanced Spaceborne Thermal Emission and Reflection Radiometer (ASTER) instrument on NASA's Terra spacecraft to help develop a strategy to extend ASTER's 15-year data set of global volcano observations into the future. Ways to improve estimates of volcano thermal data: A team led by researcher Michael Ramsey of the University of Pittsburgh is using a new ground-based instrument to collect multispectral thermal infrared data at Kilauea's lava lake as the ER-2 flies overhead. The goal is to develop an approach to correct the HyspIRI satellite's thermal infrared data on high-temperature surfaces to account for temperature mixing and apparent changes in emitted radiation. The corrections will improve the accuracy of estimates of volcanic (and wildfire) thermal output and changes in composition. Both estimates are typically used to monitor ongoing volcanic activity. Thermal anomaly detection: USGS researcher Greg Vaughan is developing a new algorithm to detect and forecast volcanic unrest or related hazards based on heat signals that precede them. The envisioned alert algorithm will be automated, able to spot anomalous thermal behavior at most volcanoes worldwide, and sensitive enough to detect relatively subtle heat signatures. The new approach, which exploits the HyspIRI satellite mission's envisioned capabilities, should allow scientists to detect small, warm anomalies that current thermal alert systems might miss. Vaughan will compare the HyspIRI airborne campaign data with HVO's own high-resolution airborne data. The observations will be merged with satellite data to generate extended time series to test and refine the new approach. Measuring changes in lava flow volume: JPL researcher Paul Lundgren is leading the upcoming GLISTIN flights, which will collect high-resolution topography data over active Kilauea lava flows to measure changes. More accurate tracking of changes in lava flow volume will improve models used to understand characteristics of active eruptions, such as changes in eruption rate. 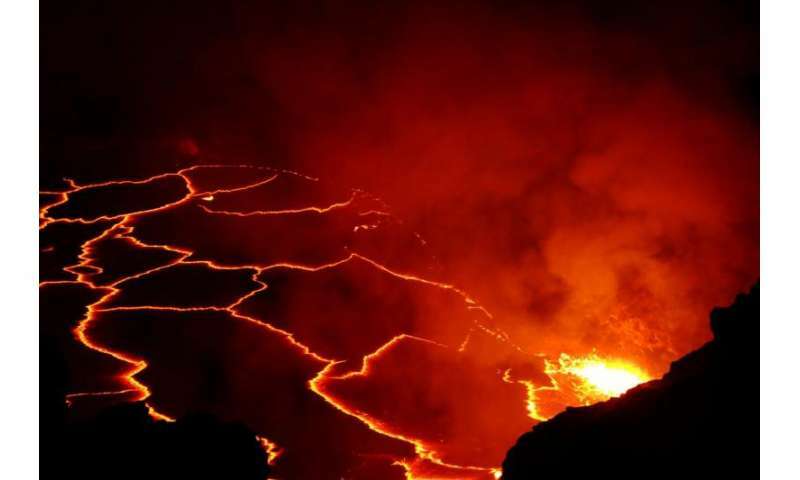 "If deployed to an evolving volcano crisis, GLISTIN could provide important measurements of lava flow volumes or lava dome growth that aren't possible with current satellites," says Lundgren. "It can help scientists better understand and predict the volume of volcanic eruptions as well as volcano behavior."